Where is the oil pressure relief valve found from underneath the vehicle? Thank you! And the oil pressure relief valve (plunger/spring) has been replaced! I'll be doing that come Fall. Did you replace the piston/spring with the oil absent from the vehicle, maybe as part of an oil change? Or, with the pan full, did you just unscrew the bolt and replace the parts? Any tips or tricks? Only a very small amount (one cup or so) drains out of the oil pump while doing this. 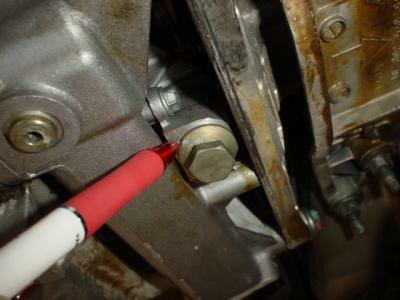 Be sure to use a new sealing washer on the plug and torque it to spec. "Tightening torque for pressure relief valve 25 Nm (19 ftlb.)"